I saw this immaculate supercharged pickup truck today in the parking lot at the Harvest Moon foodstore in Floyd, VA. I hesitate to call it a restoration because I’m not sure how much of the original metal, if any, still remains. 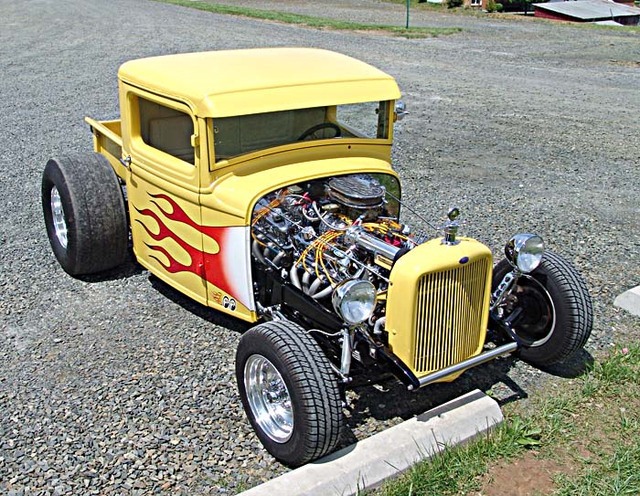 It seems to have been a very early Ford pickup and has found a new life as a toy for an older, and well-heeled, sports enthusiast. The body shell and the doors may be original, but everything else seems to have been fabricated of new material to very high standards. 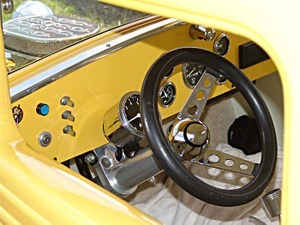 The seats are cream-colored leather and the interior is spotless. This truck is a real showpiece, but it is used for runs to downtown Floyd and is attracting lots of attention. At least four people came up while I was shooting these pictures, including one fellow who said, "It’s a shame they didn’t leave the flathead engine in it!" I wanted to bring you some history of this vehicle, but I traipsed through the Harvest Moon foodstore and the coffee shop Over The Moon asking for the owner of the Yellow Ford Truck in the parking lot with no results. I talked with several well-groomed sportsmen who looked very much like show car owners, but no one was willing to admit to owning this treasure. If anyone knows the provenance of this beauty, please send me an email. It has a Lucky Lady insignia in the rear window and Moon insignia on both sides of the cab. 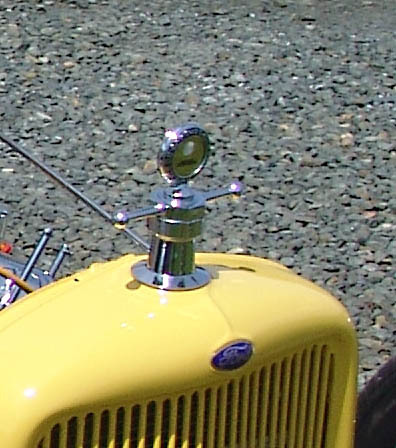 It also has a radiator ornament that seems vaguely familiar. You can click on these images to get a full-sized image. It’s a big help having knowledgeable friends! 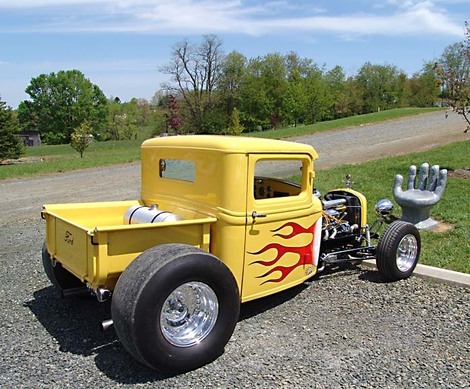 Iowahawk says, "…that appears to be a ’33 or ’34 Ford, chopped about 3" and channeled about 7", frame has likely been Z’d . 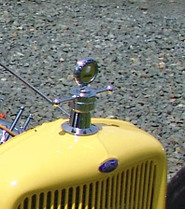 That’s a stock ’33-’34 grill, but he’s running an old Model T radiator cap on it. 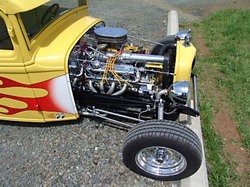 Engine is a small block Ford, probably 302 or 351, looks like a B&M supercharger setup. The pickup bed looks like a shortened Model A. 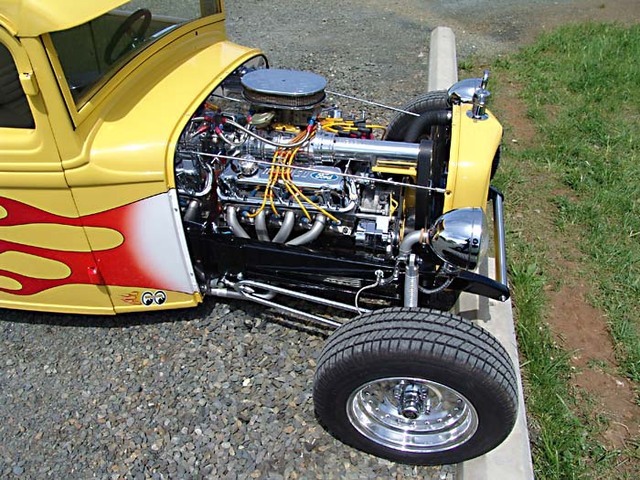 Wheels are either Cragar or Centerline." Earth Day gallery along with a link." If you would like to see more exotic cars take a look at the Flickr slideshow on the First Annual Iowahawk Earth Week Virtual Cruise Night. David, I wish to ask for your advice. I went to a job interview where the pay was low and the manager said that you should get permission to take a short break. The job is in seeking info in the net. So, I was thinking it over in my house and I sent them an email that said that I ask for higher rate and that as a professional I shouldn’t need to ask for a little break. I said that I can do a good job independently. They were very angry. They say that I can’t tell them how to run their business. Also I was told that I shouldn’t have written them but I shouldve told them these things in a meeting. What is your intake on this? Was I wrong to write? When is it OK to speak? Run, do not walk in the other direction. This is a sick company and you will regret every minute of your association with them. They want robots, not people capable of thinking for themselves. I have written several chapters about working environments like this in my book, Danger Quicksand – Have A Nice Day. Get a copy of my book and read it before searching for your next job. You need to make sure you find an employer who deserves you. Being well-prepared for an interview lets you ask the questions as well as answer them. This job was a temp for one month. My view is that I should be more careful about what I write or say but these people are no big lose.